1. The keys to good mortising are the chisels and bits. There are different patterns and qualities around. Choose the best to suit your needs. The best ones are not cheap, but will last a long time when used with care and maintained well (see photo 2). 2. Keep the chisels and bits sharp. Bit sharpening kits are readily available, but you do need to follow the instructions carefully as it is very easy to overdo the sharpening on both bits and chisels. 3. 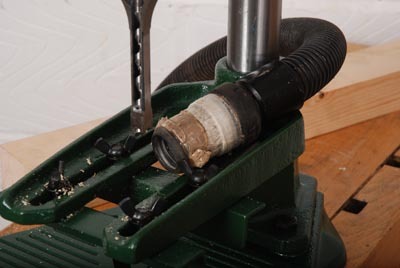 Adjustment of the chisels and bits in the arbor is crucial to avoid burning and blunting of the cutting edges. Follow exactly set-up instructions from the manual. 4. Keep the work well clamped, preferably with face edge aligned with the mortiser fence. 5. 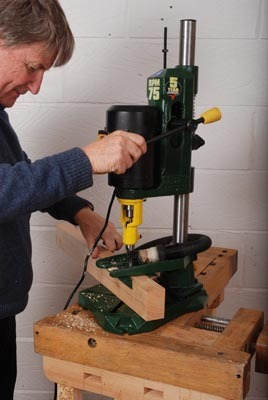 I find it easier to work to a set of marked lines rather than rely on stops when making a set of mortises (see photo 3). 6. In hardwoods especially, make a succession of cuts next to each other as this helps the bit cut more easily. 7. 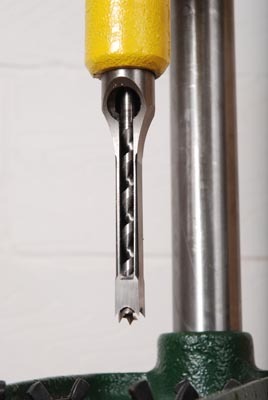 Excessive noise or burning is usually a sign of blunt bits, clogging or too fast a feed rate. 8. Don't let the tips of your bits overheat and turn blue - keep them sharp and be sensitive to the feed rate required. 9. Through mortising is possible by turning the workpiece over and cutting from the other side. 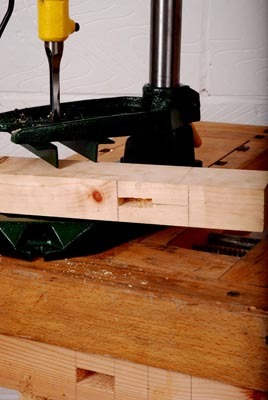 Make sure the original mortise slot is located in the middle and very accurately cut if you want the holes to meet up. Another, but maybe not the preferred way, is to rest the workpiece on a 12mm-ish thick piece of MDF and cut right through into it, if the mortiser has enough depth capacity. 10. Dust is not usually an issue when mortising, but chippings are. Avoid getting them under workpieces about to be clamped as it may lead to inaccuracies. It may be possible to have a vac extraction pipe clamped nearby to help keep the mortise slots clean as they are being cut (see photo 4).